For me Knight was someone who liked being angry with the world...it almost seemed like it was his mission in life to be angry with the world. Don't get me wrong he does have a reason to be angry...honestly if I came home to find my spouse and child had been killed I'd be a little angry too but could we maybe direct that anger towards the people who killed them and not towards anyone he happens to meet...just saying. Some things we hate to love but in Knights case it's a case of 'he loves to hate'. Day was definitely a nicer person in spite of the fact that he hasn't had the greatest life either. His parents were killed when he was young and he was raised by his brother, who rather than become bitter at having to raise his brother...chose to do the best he could for him and make a home for Dayton and himself. Whether it's losing your parents when your young or your spouse and child, either situation is painful and so incredibly hard to deal with but I don't think I would necessarily say that one was worse than the other because honestly neither is a situation that I would wish on anyone. So while I can understand Knight's anger, I just couldn't relate to his anger and bitterness...this more than anything spoiled this character for me. As for the story while the overall premise had potential in the end for me it was a little on the dry side and I have to admit if I'd been reading this rather than listening to the audio book I don't think that you'd be seeing 3 stars at the top of this review probably something closer to 2.5 rounded down to 2 or just 2.5 stars where I can actually use 1/2 stars. So much potential and sadly a lot of it fell flat for me and what should have been an interesting and compelling story was ok at best. 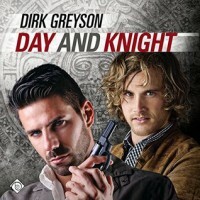 'Day and Knight' is the fourth book narrated by Andrew McFerrin that I've listened to and I have to admit this time around it was his skills as a narrator that got me through this story and solidly contributed to the 3 stars that this audio book got from me. I'm hoping that the second books goes better and maybe I'll find Knight to be a more likable character...one can always hope, right?